‘Power couple’ Virat Kohli and Anushka Sharma are not immune to trolling. Being a big name in their respective fields, they are used to facing online trolls now and then. But at the same time? Well, that would be something new for the beautiful pair. The reason behind Indian cricket captain Virat Kohli is the poor form of his side, Royal Challengers Bangalore (RCB) in the ongoing VIVO Indian Premier League (IPL) 2019. As for his wifey, Bollywood actress Anushka Sharma is getting trolled for her ‘fashion sense’ displayed during HT India’s Most Stylish Awards and GQ Style & Culture Awards. 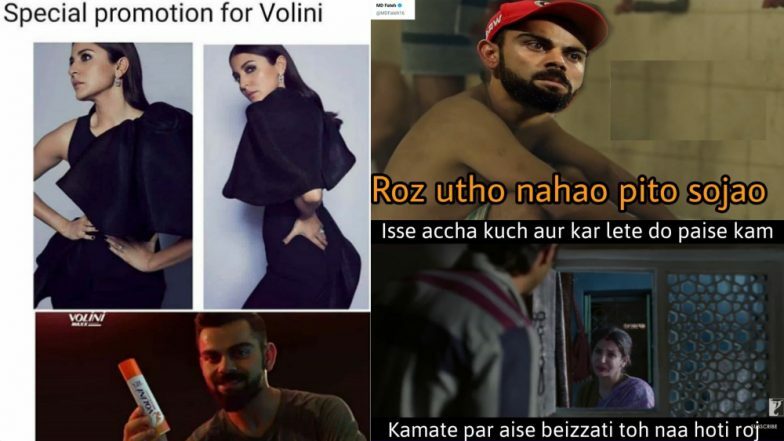 A flurry of RCB memes and hilarious jokes on Anushka’s outfits are going viral on social media platforms, especially Instagram and Twitter. Funny RCB Memes Go Viral After Virat Kohli’s Team Lose Badly Against SRH in IPL 2019! Check Out Tweets Trolling Royal Challengers Bangalore. Starting with Anushka (because you must be having a little clue why Virat is being trolled), the 30-year-old took the glamour world by storm with back-to-back bold and powerful looks. The Zero actress wore a black column gown with dramatic puffy details on one side from Toni Matičevski to the HT India’s Most Stylish Awards. While there was nothing wrong with the gown, it was one of the pictures of Anushka giving a ‘stylish’ pose that sparked the meme fest. The classic arched-back posture got everyone asking the same question – Does Anushka have back pain? Coming to her next outfit, a pantsuit from Dice Kayek SS19 collection. Now, this bee patterned pantsuit by French label she wore to 2019’s edition of the GQ Style & Culture Awards went over everyone’s head. Let’s face it, the statement pantsuit is clearly not for faint-hearted, but Anushka did a great job, carrying it with much power and elegance. Anushka Sharma Roped in By Volini? After Anushka, it’s time to talk about her husband and star Indian cricketer, Virat Kohli. The 30-year-old is having a nightmarish campaign in the ongoing IPL 12. His side Royal Challengers Bangalore slumped to their third defeat (most humiliating one) against Sunrisers Hyderabad on Sunday. In the VIVO IPL 2019 Match 11, RCB lost to SRH by 118 runs. They have also lost the matches to Chennai Super Kings and Mumbai Indians and among laggards in the points table. Getting trolled online is never acceptable, but we are sure the star husband and wife would look at these silly memes. It is too inconsequential for Virushka to pay attention to it. The young couple is a role model for everyone out there. Their hard work, their dedication and their passion speak volumes. So, trolls can continue with trolling while Virat and Anushka will look forward to being a better version of themselves.